PARLIAMENT HILL—Some 700 people gathered on Parliament Hill on Dec. 9, the eve of Human Rights Day, to deliver 95,000 petition signatures to Prime Minister Justin Trudeau and to urge his government to pressure China to end the campaign of persecution of Falun Gong. Several MPs came out to lend their voices and sometimes profound insights to the cause. Liberal MP Judy Sgro brought greetings on behalf of Prime Minister Trudeau and told the crowd that the PM had taken up their concerns. Falun Dafa was raised by Prime Minister Trudeau to the Chinese president. 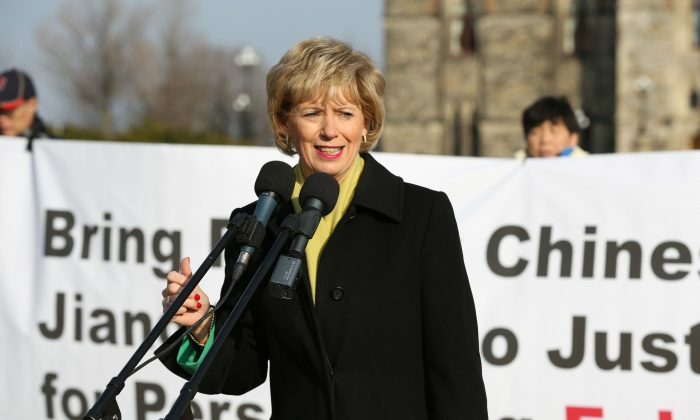 “In recent meetings that Prime Minister Trudeau has had with the Chinese leaders, the issue of human rights in China, and specifically the Falun Dafa, was raised by Prime Minister Trudeau to the Chinese president,” she said. In doing so, Trudeau joins his predecessors, Jean Chretien, Paul Martin, and Stephen Harper, who all raised the Falun Gong issue with the Chinese regime. Sgro encouraged the practitioners to keep up their efforts. Newly elected Conservative MP Garnett Genuis said governments who restrict religious freedom are inherently insecure. “They believe that this natural process of free-thinking undermines social and political stability. But free, unfettered contemplation is essential to the human experience,” he said. Free, unfettered contemplation is essential to the human experience. Liberal MP Borys Wrzesnewskyj, who tabled the first bill in Parliament (former Liberal MP Irwin Cotler filed a similar bill as well) to stop Canadians from going to China for organ transplants, said he would introduce such legislation again. Forced organ harvesting must be stopped in China, he said. Conservative MP Michael Cooper said it was a privilege to stand beside people defending principles like truthfulness, compassion, and tolerance. Conservative MP and former environment minister Peter Kent chairs the parliamentary Friends of Falun Gong and has made efforts to get other MPs as well as the Prime Minister to pay attention to the plight of Falun Gong practitioners in China. “It is a real honour to be with you again,” he said. Kent said he wanted the Canadian government to urge China to allow 200,000 criminal complaints filed by Chinese people against former Chinese leader Jiang Zemin to reach their logical end—a finding of “extreme criminality” for Jiang’s campaign to snuff out Falun Gong. Conservative MP Scott Reid, who raised Falun Gong in his first intervention as an MP in 2001, said he has always been struck by the non-violent response of Falun Gong practitioners in the face of such persecution. NDP MP Peter Julian sent a letter of greeting commending Falun Gong practitioners for following the principles of harmony, tolerance, truthfulness, and compassion. “Your bravery and courage have proven insurmountable and in the face of adversity you have not wavered from your belief and of the promotion of human rights,” he wrote. Former Progressive Conservative and Liberal MP David Kilgour said he and all the other speakers were deeply touched by how Falun Gong practitioners have withstood persecution in China. Kilgour, one of the first people to investigate live organ harvesting from Falun Gong prisoners of conscience in China, said others have carried out their own investigations and found similar results.